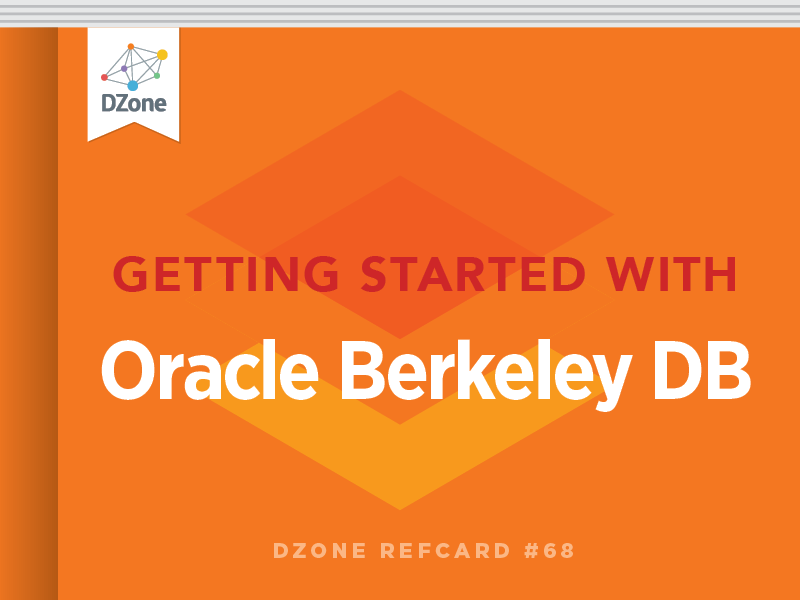 Provides a brief introduction to the Oracle Berkeley DB family and discusses in depth the Oracle Berkeley DB Java Edition. The Oracle Berkeley DB (BDB) family consists of three open source data persistence products which provide developers with fast, reliable, high performance, enterprise ready local databases implemented in the ANSI C and Java programming languages. The BDB family typically stores key-value pairs but is also flexible enough to store complex data models. BDB and BDB Java Edition share the same base API, making it possible to easily switch between the two. We will review the most important aspects of Oracle BDB family briefly. Then we will dig deep into Oracle BDB Java Edition and see what its exclusive features are. We discuss Based API and Data Persistence Layer API. We will see how we can manage transactions DPL and Base API in addition to persisting complex objects graph using DPL will form the overall development subjects. Backup recovery, tuning, and data migration utilities to migrate data between different editions and installations forms the administrations issues which we will discuss in this Refcard. Berkeley DB is written in ANSI C and can be used as a library to access the persisted information from within the parent application address space. Oracle BDB provides multiple interfaces for different programming languages including ANSI C, the Java API through JNI in addition to Perl, PHP, and Python. Built on top of the BDB, the BDB XML edition allows us to easily store and retrieve indexed XML documents and to use XQuery to access stored XML documents. It also supports accessing data through the same channels that BDB supports. BDB Java Edition is a pure Java, high performance, and flexible embeddable database for storing data in a key-value format. It supports transactions, direct persistence of Java objects using EJB 3.0-style annotations, and provides a low level key-value retrieval API as well as an “access as collection” API. Each of the BDB family members supports different feature sets. BDB XML edition enjoys a similar set of base features as the Core BDB. BDB Java edition on the other hand is implemented in a completely different environment with an entirely different set of features and characteristics (See Table 4). The base feature sets are shown in Table 1. Table 2 shows how these features are distributed between the different BDB family members. The BDB family of products has several special features and offers a range of unique benefits which are listed in Table 3. Features unique to BDB Java Edition are listed in Table 4. These features, along with a common set of features, make the Java edition a potential candidate for use cases that require caching, application data repositories, POJO persistence, queuing/buffering, Web services, SOA, and Integration. You can download BDB JE from http//bit.ly/APfJ5. After extracting the archive you’ll see several directories with selfdescribing names. The only file which is required to be in the class path to compile and run the included code snippet is je- 3.3.75.jar (the exact file name may vary) which is placed inside the lib directory. Notice that BDB JE requires J2SE JDK version 1.5.0_10 or later. BDB JE provides three APIs for accessing persisted data. The Base API provides a simple key-value model for storing and retrieving data. The Direct Persistence Layer (DPL) API lets you persist any Java class with a default constructor into the database and retrieve it using a rich set of data retrieval APIs. And finally the Collections API which extends the well known Java Collections API with data persistence and transaction support over data access. The Base API is the simplest way to access data. It stores a key and a value which can be any serializable Java object. DatabaseEntry dataValue = new DatabaseEntry(“ data content”. DatabaseEntry keyValue = new DatabaseEntry(“key content”. dataValue = new DatabaseEntry(“updated data content”. There are multiple overrides for the Database.put method to prevent duplicate records from being inserted and to prevent record overwrites. DPL sample consists of two parts, the entity class and the entity management class which handle CRUD over the entity class. This is a simple POJO with few annotations to mark it as an entity with a String primary key. For now ignore the @Secondarykey annotation, we will discuss it later. These two code snippets show the simplest from of performing CRUD operation without using transaction or complex object relationships. An Environment provides a unit of encapsulation for one or more databases. Environments correspond to a directory on disk. The Environment is also used to manage and configure resources such as transactions. EnvironmentConfig is used to configure the Environment, with options such as transaction configuration, locking, caching, getting different types of statistics including database, locks and transaction statistics, etc. One level closer to our application is DatabaseConfig and Database object when we use Base API. When we use DPL these objects are replaced by StoreConfig and EntityStore. In Base API DatabaseConfig and Database objects provide access to the database and how the database can be accessed. Configurations like read-only access, record duplication handling, creating in-memory databases, transaction support, etc. are provided through DatabaseConfig. In DPL StoreConfig and EntityStore objects provide access to object storage and how the object storage can be accessed. Configurations such as read only access, data model mutation, creating in-memory databases, transaction support, etc. are provided through StoreConfig. The PrimaryIndex class provides the primary storage and access methods for the instances of a particular entity class. There are multiple overrides for the PrimaryIndex.put method to prevent duplicate entity insertion and provide entity overwrite prevention. When closing an Environment or Database or when we commit a Transaction in a multi thread application we should ensure that no thread still has in-progress tasks. A BDB JE database consists of one or more log files which are placed inside the environment directory. The log files are named NNNNNNNN.jdb where NNNNNNNN is an 8-digit hexadecimal number that increases by 1 (starting from 00000000) for each log file written to disk. BDB JE rolls to next file when the current file size reaches the predefined configurable size. The predefined size is 10MB. A BDB database can be considered like a relational table in an RDBMS. In Base API we directly use the database we need to access, while in DPL we use an EntityStore which may interact with multiple databases under the hood. Each BDB environment can contain tens of databases and all of these databases will be stored in a single row of log files. (No separate log files per-database). Figure 1 shows the concept visually. To create in-memory database we can use DatabaseConfig. setTemporary(true) and StoreConfig.setTemporary(true) to get an in-memory instance with no data persisted beyond the current session. Figure 1: BDB JE environment and log files. The environment path should point to an already existing directory, otherwise the application will face and exception. When we create an environmnt object for the first time, necessary files are created inside that direcory. Table 5 shows Base API characteristics and benefits. The keyvalue access model provides the most flexibility. Index fields can be accessed using a standard java.util collection. Table 6 and Table 7 list the features that mostly determine when we should use which API. Table 7 lists possible use cases for each API. The simplicity of BDB JE Transaction Support makes it very suitable for transactional cache systems. The isolation level, deferrable and manual synchronization of transactional data with hard disk (Durability), replication policy, and transaction lock request and transaction lifetime timeout can be configured using the Transaction and TransactionConfig objects. Transaction support in Base API is a bit different, as in Base API we directly deal with databases while in DPL we deal with environment and EntityStore objects. The following changes will allow transaction support in Base API. More transaction related supported features are demonstrated in this snippet. Environment, Database, EntityStore, etc. configuration is omitted from these snippet for sake of simplicity. Once a transaction is committed, the transaction handle is no longer valid and a new transaction object is required for further transactional activities. For this section we leave Base API alone and focus on using DPL for complex object graphs. We continue with introducing secondary index and many-to-many mapping. Let’s look at some important annotations that we have for defining the object model. @Entity Declares an entity class; that is, a class with a primary index and optionally one or more indices. @PrimaryKey Defines the class primary key and must be used one and only one time for every entity class. @SecondaryKey Declares a specific data member in an entity class to be a secondary key for that object. This annotation is optional, and can be used multiple times for an entity class. @Persistent Declares a persistent class which lives in relation to an entity class. @NotTransient Defines a field as being persistent even when it is declared with the transient keyword. @NotPersistent Defines a field as being non-persistent even when it is not declared with the transient keyword. @KeyField Indicates the sorting position of a key field in a composite key class when the Comparable interface is not implemented. The KeyField integer element specifies the sort order of this field within the set of fields in the composite key. We used two of these annotations in practice and you saw @SecondaryKey in the Employee class. Now we are going to see how the @SecondaryKey annotation can be used. Let’s create the Project entity which the Employee class has a many-to-many relation with. The @PrimaryKey annotation has a string element to define the name of a sequence from which we can assign primary key values automatically. The primary key field type must be numerical and a named sequence can be used for multiple entities. Now let’s see how we can store and retrieve an employee with its related project objects. EntityIndex<String, Employee> projs = empsByProject.subIndex(proj. The Environment and EntityStore definitions are omitted. The SecondaryIndex provides primary methods for retrieving objects related to the Secondary Key of a particular object. The SecondaryIndex can be used to retrieve the related objects through a traversable cursor. We can also use SecondaryIndex to query for a specific range of objects in a given range for its primary key. ONE_TO_ONE A single entity is related to a single secondary key value. ONE_TO_MANY A single entity is related to one or more secondary key values. MANY_TO_ONE One or more entities are related to a single secondary key value. MANY_TO_MANYOne or more entities are related to one or more secondary key values. A SecondaryIndex can be used to traverse over the collection of secondary key’s values to retrieve the secondary objects. Multiple processes can open a database as long as only one process opens it in read-write mode and other processes open the database in read-only mode. The readonly processes get an open-time snapshot of the database and won’t see any changes coming from other process. The only different between using BDB JE collections API and classic collections is the fact that when we use BDB JE Collections API we are accessing persisted objects instead of in-memory objects which we usually access in classic collection APIs. An implementation Map, SortedMap, Set, SortedSet, and Iterator. To stay compatible with Java Collections, Transaction is supported using TransactionWorker and TransactionRunner which the former one is the interface which we can implement to execute our code in a transaction and later one process the transaction. Keys and values are represented as Java objects. Custom binding can be defined to bind the stored bytes to any type or format like XML, for example. Data binding should be defined to instruct the Collections API about how keys and values are represented as stored data and how stored data is converted to and from Java objects. We can use one of the two (SerialBinding, TupleBinding) default data bindings or a custom data binding. Environment, EnvironmentConfig, Database and DatabaseConfig stay the same as it was for Base API. Collections API extends Java serialization to store class description separately to make data records much more compact. To get a real sense about BDB JE Collections API think of it as we can persist and retrieve objects using a collection class like SortedMap’s methods like tailMap, subMap or put, putall, get, and so on. But before we use the SortedMap object to access the stored data, we need to initialize the base objects like Database and Environment; we should create the ClassCatalog object, and finally we should define bindings for our key and value types. Now let’s see how we can store and retrieve our our objects using Collections API. In this sample we are persisting a pair of Integer key and String value using SortedMap. First lets analyze the TransactionWorker implementation. TransWorker implements TransactionWorker which makes it necessary to implement the doWork method. This method is called by TransactionRunner when we pass an object of TransWorker to its run method. The TransWorker constructor simply receive an Environment object and construct other required objects . Then it opens the database in Collection mode, creates the required binding for the key and values we want to store in the database and finally it creates the SortedMap object which we can use to put and retrieve objects using it. Now let’s see the driver code which put this class in action. We can simply backup the BDB databases by creating an operating system level copy of all jdb files. When required we can put the archived files back into the environment directory to get a database back to the state it was at. The best option is to make sure all transactions and the write process are finished to have a consistent backup of the database. The BDB JE provides a helper class located at com.sleepycat. je.util.DbBackup to perform the backup process from within a Java application. This utility class can create an incremental backup of a database and later on can restore from that backup. The helper class ideally freezes the BDB JE activities during the backup to ensure that the created backup exactly represents the database state when the backup process started. Cleaner Thread Responsible for cleaning and deleting unused log files. This thread is run only if the environment is opened for write access. Checkpointer Thread Basically keeps the BTree shape consistent. Checkpointer thread is triggered when environment opens, environment closes, and database log file grows by some certain amount. Compressor Thread For cleaning the BTree structure from unused nodes. These threads can be configured through a properties file named je.properties or by using the EnvironmentConfig and EnvironmentMutableConfig objects. The je.properties file, which is a simple key-value file, should be placed inside the environment directory and override any further configuration which we may make using the EnvironmentConfig and EnvironmentMutableConfig in the Java code. The other performance effective factor is cache size. For ondisk instances cache size determines how often the application needs to refer to permanent storage in order to retrieve some data bucket. When we use in-memory instances cache size determines whether our database information will be paged into swap space or it will stay in the main memory. je.cleaner.minUtilization Ensures that a minimum amount of space is occupied by live records by removing obsolete records. Default occupied percentage is 50%. je.checkpointer.bytesInterval Determines how often the Checkpointer should check the BTree structure. If it performs the checks little by little it will ensure a faster application startup but will consume more resources specially IO. je.maxMemory Percent Determines what percentage of JVM maximum memory size can be used for BDB JE cache. To determine the ideal cache size we should put the application in the production environment and monitor its behavior. A complete list of all configurable properties, with explanations, is available in EnvironmentConfig Javadoc. The list is comprehensive and allows us to configure the BDB JE at granular level. All of these parameters can be set from Java code using the EnvironmentConfig object. The properties file overrides the values set by using EnvironmentConfig object. Three command line utilities are provided to facilitate dumping the databases from one environment, verifying the database structure, and loading the dump into another environment. DbDump Dumps a database to a user-readable format. DbLoad Loads a database from the DbDump output. DbVerify Verifies the structure of a database. The JAR file name may differ depending on your version of BDB JE. These commands can also be used to port a BDB JE database to BDB Core Edition. A very good set of tutorials for different set of BDB JE APIs are available inside the docs folder of BDB JE package. Several examples for different set of functionalities are provided inside the examples directory of the BDB JE package.